Last night, I installed Ubuntu's latest offering Ubuntu 9.10 also known as Karmic Koala on a partitioned hard drive. Following the installation, GRUB2 did not detect Windows 7, which was on an other partition. I figured out the way to get it. Step 1: Login to Recovery Mode of the Ubuntu 9.10 Kernel. Step 2: Once the Recovery mode screen is displayed, look for the option Update GRUB. Click on it. Step 3: GRUB will detect all the installations including Windows 7 on another partitions. Step 4: Restart and you will find Windows 7 in the GRUB Boot Loader. For example; if you want to Open Firefox, click on GNOME Do icon on the extreme left of the Dock Bar and type Firefox. It will Open Firefox. Similarly, if you want to access say your music files located in a folder titled "Music", instead of going through the menu route, just type Music. It will display the Music folder. 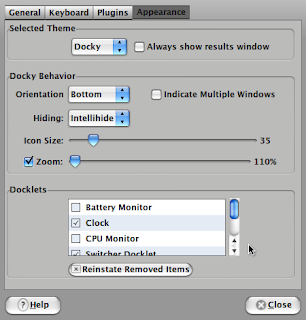 In the past I used Awn (Avant Window Navigator) and Cairo docks. Though the appearance of Awn dock is good, functionally it seems a bit unstable. Cairo dock on the other hand has two different versions; (1) Cairo-Dock (No OpenGL), which is relatively stable, (2) GLX-Dock (Cairo-Dock with OpenGL), which is very unstable, though graphically it seems to be quite attractive. Cairo-Dock is probably the best of the three for customisation. GNOME Do however is the most stable of the three docks. 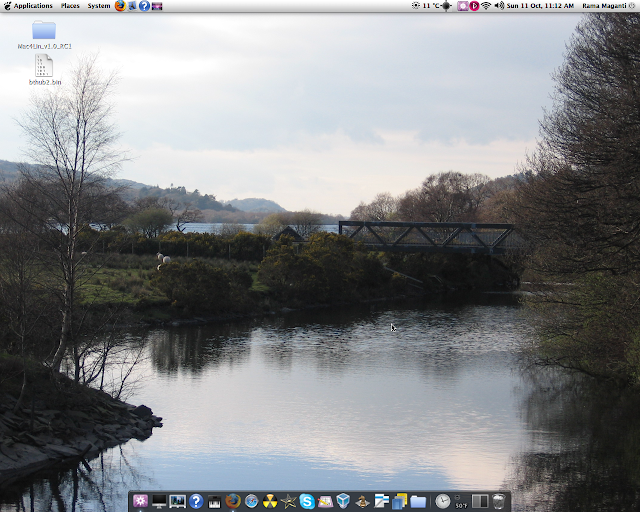 The stability seems to stem from the fact that GNOME Do is just a simple 2D dock bar. Thus, for this reason I am sticking to GNOME Do for the moment, though I may give an occassional shot at the other two. After writing this post, I went back to check the stability of Awn. It seems like Awn has become lot more stabler. 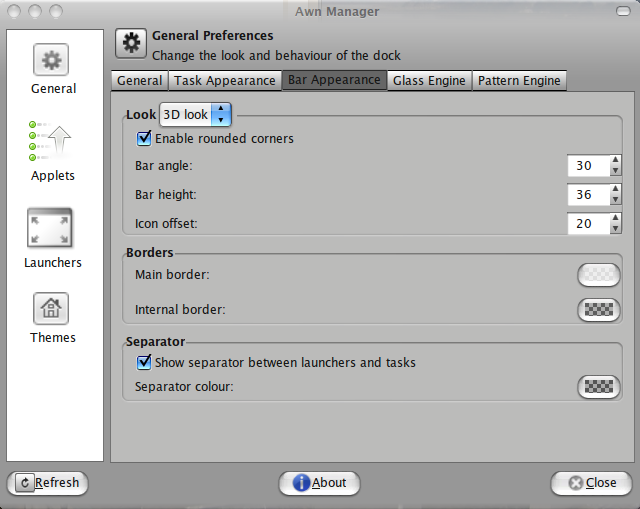 Have a look at the screenshot of the Awn dock bar. It appears like the icons are placed on top of an iPhone. This can be done by setting the Bar Appearance as per the following screen. I am beginning to like this Awn dock bar. So bye-bye GNOME Do and welcome to Awn.